One Waterfall Bay is an elegant six-bedroom retreat set in a peaceful hillside estate with expansive sea views. 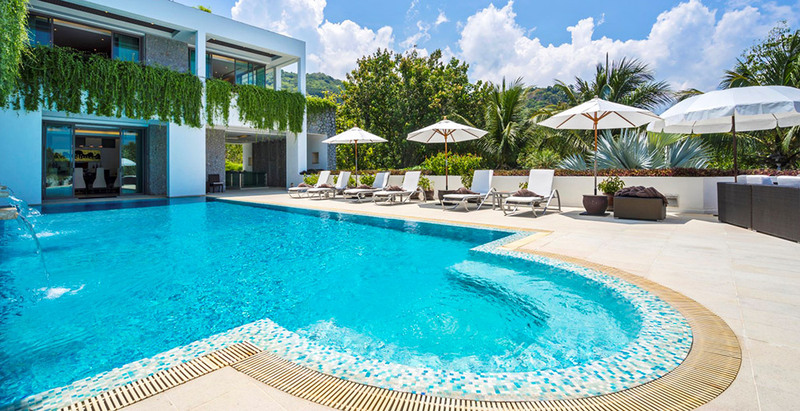 Just minutes from Kamala Beach, the villa offers total privacy and rejuvenation with generous indoor and outdoor living areas, a cinema room, spa for total relaxation, swimming pool and sea-view jacuzzis. The villa has pool tables, tennis tables and games for your entertainment. The grounds are enclosed, ideal for families. Five spacious bedroom suites plus a smaller ‘extra’ bedroom are all ensuite. Relaxation is assured with a Thai chef on hand to prepare every meal in the villa’s professional kitchen, plus a villa manager and concierge service, while private chauffeured transport allows you to explore the island with ease.